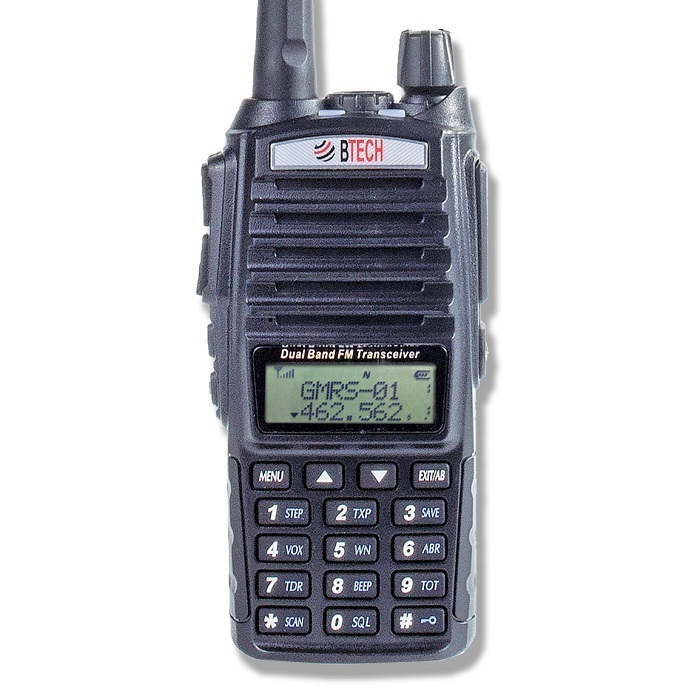 We are excited to announce the most flexible GMRS radio, the BTECH GMRS-V1. The GMRS-V1 includes 23 modifiable channels for GMRS and 105 scanner memories. Unique capabilities, such as on-the-fly channel modifications, allow you to easily edit your GMRS-V1 tones to be compatible with other GMRS radios. SIMULTANEOUS DISPLAYFor those that want to have the most information at their fingertips on a specific channel – they can synchronize the displays. You can configure the displays to synchronize and allow both the Channel Name and frequency to simultaneously display on the current selected channel. SIMPLER OPTIONSChannel Skip: Easily add or remove a channel from the scanning list – if you have a nuisance channel, just skip it. Dual or Single PTT: Easily toggle the GMRS-V1 side keys to act as a single or dual push-to-talk switch. 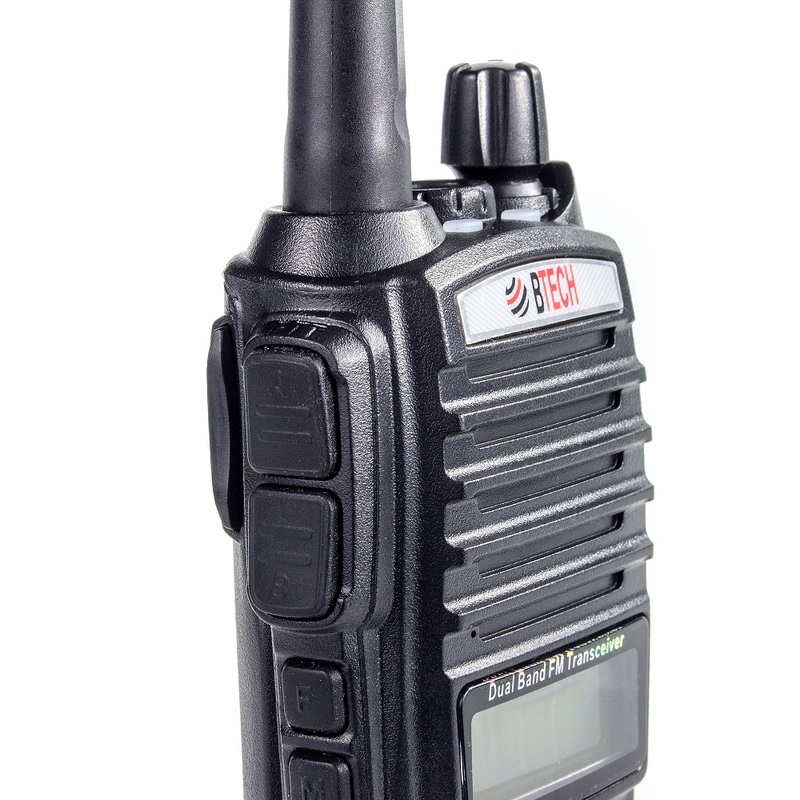 The GMRS-V1 allows you to transmit on both displayed channels by the use of two independent side keys. By pressing on the upper side key you transmit on “Channel A” and by pushing on the lower side key you transmit on “Channel B”. On the GMRS-V1 you are able to synchronize the two PTT buttons (right from menu) to enable single Push-to-Talk operation (which will default to the current selected channel). EASY TO USEThe GMRS-V1 is easy and straight forward to use. The GMRS-V1 comes with GMRS two-way and GMRS repeater channels pre-programmed. You can easily modify the GMRS-V1 to transmit a Privacy tone, right from the radio menu. You can even require a privacy tone for incoming transmissions. You can mix and match tones for repeater usage. The GMRS-V1 will save any modification to the channel (even during a reboot) and will remember any channel change you apply in any mode. Want to communicate with other GMRS users with other brand GMRS radios? There is no guesswork involved anymore between brands. The GMRS-V1 can work with any GMRS radio – and has every single privacy tone option available (more than any other GMRS radio). Even if other users don’t know which privacy tone is being used on their GMRS radio; you are able to scan for which tone is being used. This ensures easy compatibility with all brands. GMRS frequencies and offsets cannot be altered to allow peace of mind while using your GMRS-V1. Want to start from scratch? A simple reset menu option resets the GMRS-V1 to the GMRS-V1 defaults. DUAL WATCH RECEIVERThe GMRS-V1 has one built-in receiver but can “watch” two channels (semi duplex). Monitor 2 GMRS channels or monitor two different frequencies (even on different bands (VHF/UHF)) and the radio will monitor both frequencies giving priority to the first station to receive an incoming call.